Trusted Advisors to leading companies across the nation since 2006. Our differentiated approach allows businesses to identify and engage the behaviours and motivations that lead to sustained improvement. Having trained over 4,000 leaders, we are trusted advisors within Canada’s top companies. We align people with business strategies to achieve a competitive advantage. View Our Predictive Success Corporate Video. See how our workforce analytics can help you make better people decisions. For your own personal, confidential FREE TRIAL on us, call Shared Services at 1.855.430.9788 Ext. 104 or info@predictivesuccess.com. 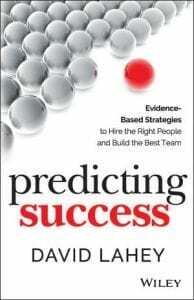 Predicting Success is a practical guide to finding the perfect member for your team. By applying the principles and tools of human analytics to the workplace, you’ll avoid bad culture fits, mismatched skillsets, entitled workers, and other hiring missteps that drain the team of productivity and morale. This book provides guidance toward implementing tools like the Predictive Index®, behaviour analytics, hiring assessments, and other practical resources to build your best team and achieve the best outcomes. Written by a human analytics specialist, Predictive Success President David Lahey, who applies these principles daily, this book is the manager’s guide to aligning people with business strategy to find the exact person your team is missing.